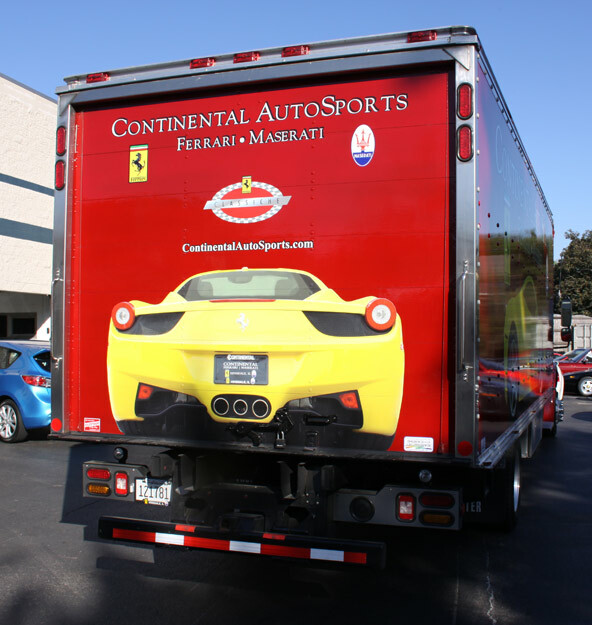 One of the greatest ways to keep your company's name & offerings fresh in the community's minds is with well designed & executed vehicle graphics. 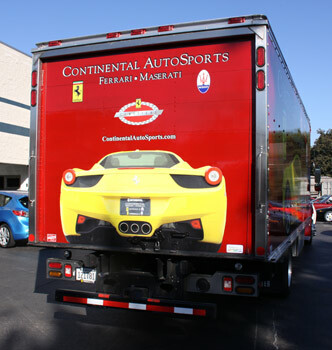 Hundreds of thousands of visual impressions occur each year whether your vehicle is parked or moving down the highway. Even towns that have strict signage rules cannot limit the advertising you put on your company vehicles. Think of it as a rolling billboard. We do full vehicle wraps, partial wraps or straight vinyl lettering. Let us help you design one of the most cost effective advertising mediums available. 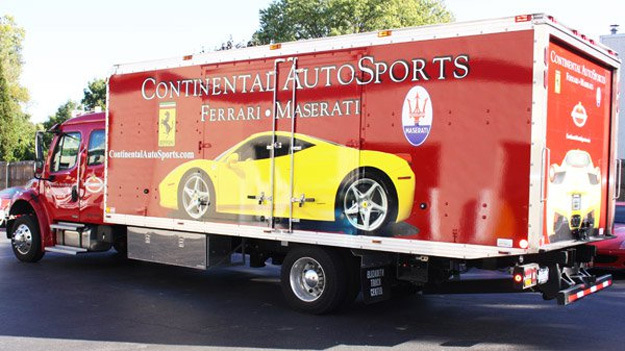 A life-size Ferrari 458 Italia was chosen to flank this Ferrari transporter. The contrasting colors really turn heads. We shot the photography, did all the design work, production & installation. This car is in such demand, the hardest part of the job was holding on to the car long enough to get the photo shoot scheduled. 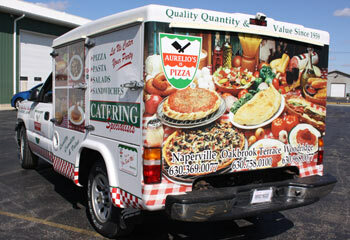 A local pizza chain had some great photography for us to use on this hot/cold box truck. 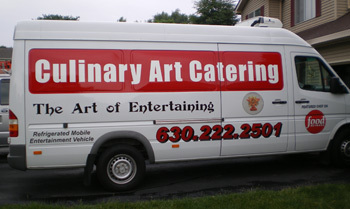 Not only is it a professional way to deliver the catering, is certainly is a rolling billboard that arouses your senses. This is one of our company vehicles. 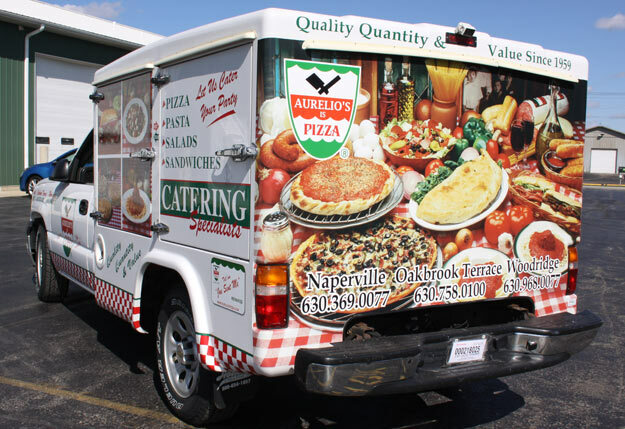 Transforming a standard white cargo van into a 24/7 sales tool makes all the marketing sense. It brings new business to us daily. 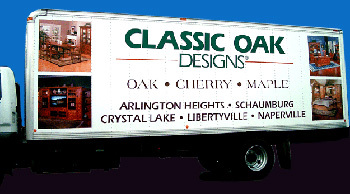 There are four major rooms in your home that this furniture store specializes in. Each category is displayed in 4'x4' photographs placed on each side along with the locations of their stores. Blue Cross uses these busses as mobile vaccination doctors offices. The large "happy" faces make it look less intimidating when it pulls into a location. A lot of information on this wrap but still a clear statement. The understated look on this van is exactly what the customer was looking for. This Porsche dealer started with an all white Nissan NV high top truck. We did a full wrap on it and it is easily identifiable now. 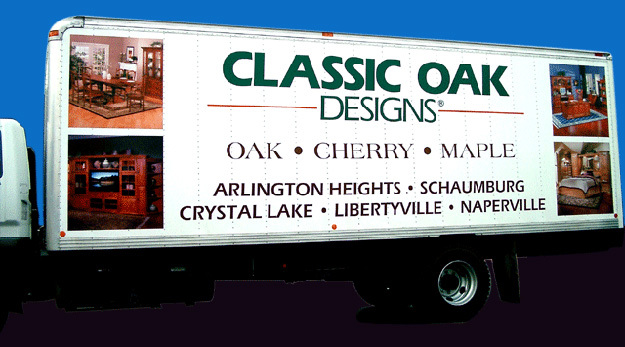 We started this wrap with a pretty tired, older truck. The new logo we created, full wrap and new hubcaps really transformed it to a very effective sales too. The rear roll up door was all red & so was the latch & locking mechanism. We painted these parts & wrapped some of them with the car's image. You can even read the part numbers on the tail lights. The visual impact is quite stunning. No question as to what the purpose of this Sprinter is. The company's principals were featured on the Food Network so we prominently displayed that distinction on the front doors. Phone number is the mobile phone number so when you see the van, call the number you could potentially pull over & have a meeting with the owner about your catering needs. 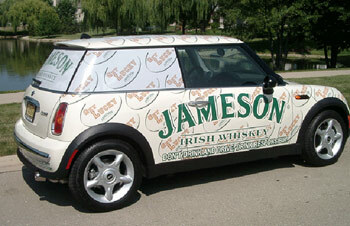 This Mini ran around to many locations promoting their brand and product. At the end of the promotion, the Mini was given away to a customer that entered their promotion.